Carpet represents a large investment in your home. There are a few simple things you can do to get more life out of your carpet. Keeping your carpet clean is the first thing to remember when planning to extend the life of your carpet. Unfortunately, that’s not always so simple. Kids, pets and husbands can certainly do some serious damage to your carpet. To get more life out of your carpet invest in a good vacuum and learn to use it properly. Do not invest in carpet spotters. Find a good carpet cleaner who specializes in steam cleaning. Believe it or not, most people don’t know how to vacuum correctly. The trick is to vacuum your carpet slowly. Slowly. And regularly. These two things will absolutely get more life out of your carpet. At least once a week give your carpet a good, slow vacuum. By slowing down, you allow the vacuum to pick up more dry soil during the cleaning process. Removing dry soil is probably the best way to get more life out of your carpet. Dry soil is abrasive and sharp. When it’s not removed with regular vacuuming, tiny pieces of soil begin to cut and tear at the carpet fibers. This is known as wear in the carpet industry and it’s not something that can be reversed. Get more life out of your carpet by vacuuming regularly and slowly. 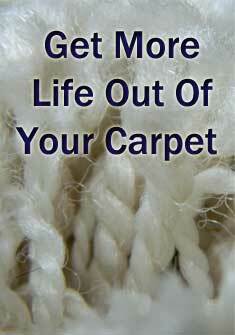 The next tip to get more life out of your carpet is to avoid carpet spotters. At first carpet spotters seem to help remove spills and spots, but they often do more damage over time. Most spotters leave a soapy residue in your carpet. Over time, dust and soil attract to the area where you used the spotter, leaving you with a dark brown spot. Try using a 50/50 mixture of white vinegar and water to clean up spills and pet accidents. The vinegar is a natural cleaner and will not leave a residue on your carpet fibers. You should also consider having your carpets steam cleaned once a year. Carpet manufacturers recommend an annual steam cleaning to get more life out of your carpet. Even if your carpet looks clean, dust and dander still linger within the carpet fibers. An annual steam cleaning will help to prevent carpet wear by removing dry soil. Want to get more life out of your carpet? Vacuum slowly and regularly because it will remove dry soil. Don’t use carpet spotters. Over time spotters often do more damage by attracting soil with the soap residue they leave behind. Instead, keep a 50/50 mixture of white vinegar and water on hand for a safe and effective way clean up small spills and spots. Invest in an annual steam cleaning to get more life out of your carpet. Follow these simple tips and you’re sure to get more life out of your carpet.